San Francisco artist Mimi Jensen updates the traditional still life—incorporating humor and visual puns in her arrangements of non-traditional subjects. Jensen’s love of language is apparent in the witty titles she chooses for her work, which add a layer of meaning to the imaginative narratives she portrays. Jensen’s still life paintings contain an intriguing mix of everyday objects—things she finds at thrift stores, estate sales, farmers markets or at a friend’s house. 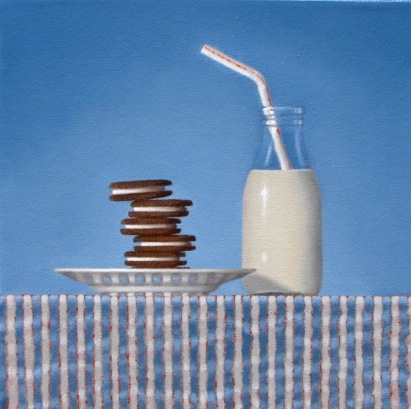 Jensen takes a playful approach to her compositions, arranging and re-arranging until the conversation among the objects has just the right balance and chemistry. Objects clearly relate to one another, and exist in distinct harmony—even when the placement is a bit precarious. 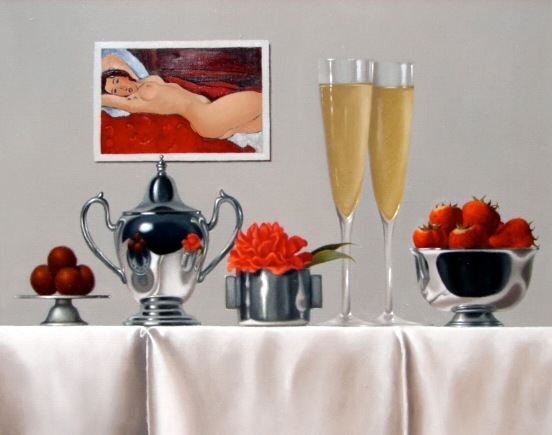 Jensen is very interested in reflective surfaces (silver balls and sugar bowls, martini glasses) and saturated color, and the balance of these elements also play an important part in her work. VR: Once the composition and lighting are set, how do you get started? MJ: After choosing the correct size canvas for the final set-up, I give the canvas a sepia wash of raw umber to make it a mid-range tone so that both light and dark marks will be discernible. Using a straight-edge I draw a line where the objects will sit (a tablecloth, a shelf) and I mark the inches along that line to help me place the objects in the painting. I also mark the inches on the actual still life set-up so that when I start laying it in, the objects on the canvas correspond exactly to the placement in the set-up. I paint the objects in true life size, so this method works well. Of course, I cheat a bit when needed—I’ll make a bottle taller or shorter if it serves the composition. Next, still using raw umber, I loosely sketch the objects with paint, mostly just outlining their shapes at first. After I am content that the composition is good and that the objects are about the right size and shape, I start to refine the images, still using raw umber. Next I paint the entire scene, covering the whole canvas in raw umber and white, painting everything realistically and getting the correct lights and darks established. This is a technique called grissaille. Traditionally, grissaille is followed by many transparent glazes, and although I use glazes later in my process, at this point, after the grissaille is finished, I almost always start painting in color rather than glazes. Once I am satisfied with the painting in monotone, I start applying the color, essentially repainting the entire canvas. Sometimes I like the painting so much in its monochromatic state that I am reluctant to paint over it in color. Once or twice I’ve completed a painting in umber and white. From there it’s a matter of refining all the objects depicted, making sure they look right to me—blending, blending, blending. Sometimes I notice some new detail even after becoming so familiar with the object. Finally, I glaze any parts that need a color adjustment, e.g., putting an even brighter red over a tomato, or a brown glaze over a metal object to give it warmth. It’s easy to go too far at this stage. In the very last session, I paint the background, adjusting the depth of color from the initial wash to the otherwise finished painting, cleaning up the edges while trying to keep them soft, slightly blurry. I try to avoid the hard-edged look. Most paintings take me about a month to complete. VR: You’ve been exhibiting your work for twenty-five years. When did you settle on still life? MJ: For the first 15+ years, I kept admonishing myself to loosen up. 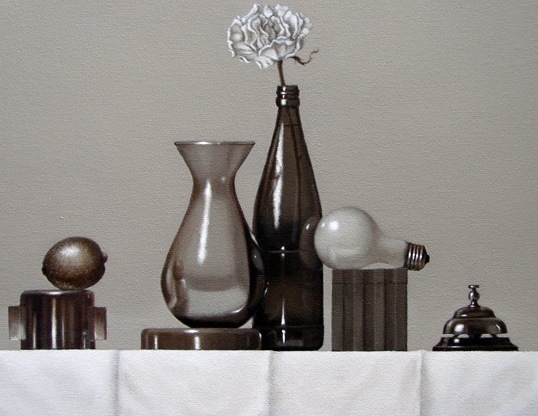 Finally, after a two-week intensive workshop with John Morra in 2003, I gave myself permission to paint realistic, detailed paintings, and started concentrating on the still life. I think as artists we don’t necessarily value what comes easily to us, but I finally started to value my ability, allowing myself that pleasure, realizing that painting “tight” suits me. 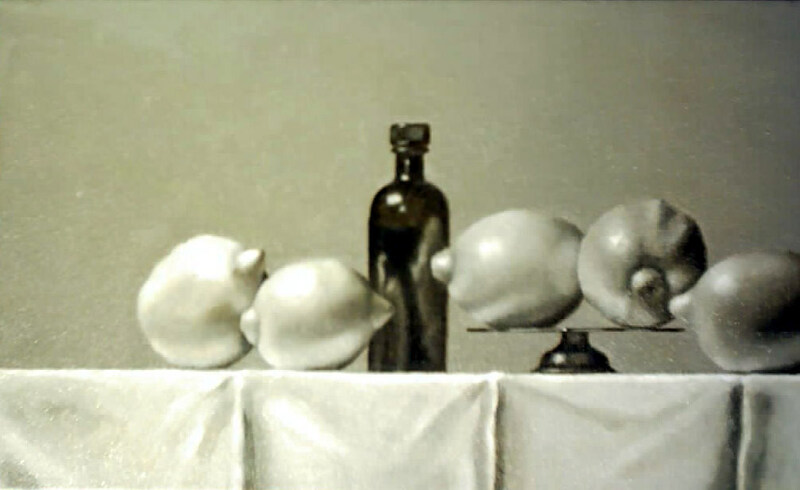 I’m often reluctant to say I’m a still life painter because people have misconceptions about what a still life is—they imagine dead pheasants, bottles of wine, half-peeled tangerines. I find these boring and often merely a vehicle for exhibiting technical skill. 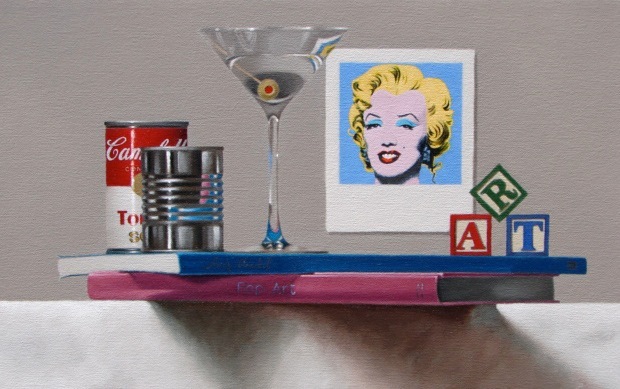 I like to paint found objects and things like jars of olives, cigar boxes, martini glasses, toys—and, of course, post cards of famous paintings. I often reuse the same objects again and again, like old actors appearing together in a new play. VR: Which still life painters do you admire? Other contemporary favorites are Norman Lundin, a Seattle artist who paints realistic objects in abstracted settings and Bay Area artist Donald Bradford—there is a serenity about his books. VR: What would you like people to take from your paintings? MJ: I’m a realist and I am fascinated with the way things look. For me, painting is all about seeing—acute observation and attention to detail. Which is why I work from life, never from photographs. I want to create images that the viewer will linger over—I want to show them something they may otherwise have overlooked. Trompe l’oeil or illusionism doesn’t hold my interest for very long unless there’s an idea behind it. It is important to me for the spectator to bring his own narrative. I always enjoy when people “get” my jokes and allusions, which often involve the title. I presume an audience that is familiar with the reproductions I use because they are by well-known artists, but I also include what I hope are subtler references or jokes. 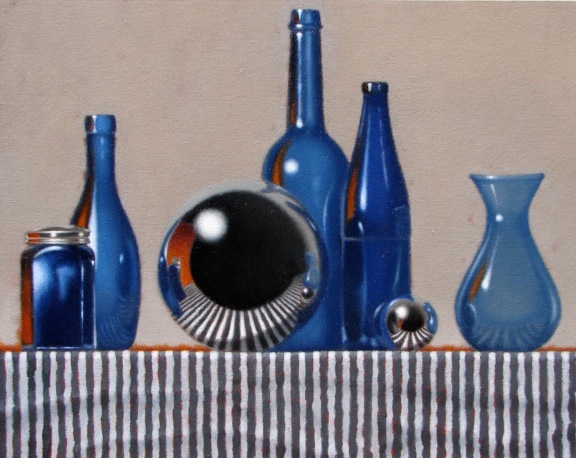 For example, the recent painting The Blues, a painting of blue bottles, includes a black and white tablecloth that suggests piano keys, which I hope causes the viewer to wonder if the title refers to the color of the bottles or the music. VR: Six of your new paintings are titled A Week at the Met, what’s the story behind that? MJ: I love the Metropolitan Museum of Art, and never felt I had enough time to spend there on my visits to New York. Recently, I was able to spend an entire week—all day, every day—at the Met (with some side trips to the Museum of Modern Art.) This resulted in an on-going series of paintings, the first six of which are in my current show at Hespe. Mimi Jensen’s new work will be on exhibit at the Hespe Gallery, 251 Post Street, Suite 420, San Francisco, from September 1-October 2, 2010. The opening reception is from 5-7 pm, Saturday, the 11th of September. This entry was posted on September 1, 2010 at 2:51 am and is filed under Bay Area Art Scene, Christine Cariati, Female Artists, Fine & Decorative Arts, Painting with tags Donald Bradford, Fairfield Porter, Giorgio Morandi, Hans Hoffman, Hespe Gallery, Jane Freilicher, John Morra, Mark Tansey, Martha Alf, Mimi Jensen, Nell Blaine, Norman Lundin, Paul Cezanne, Paul Wonner, Pierre Bonnard, Richard Diebenkorn, Vija Clemins. You can follow any responses to this entry through the RSS 2.0 feed. You can leave a response, or trackback from your own site. I enjoyed this interview very much. It’s fun to get a peek at the Jensen’s process. She has a great sense of humor, which comes out in her wonderful work. Thank you. Maureen – I’ve noticed that people are curious about the art process but are often reluctant to ask questions so I was delighted that VR wanted to concentrate on process, giving their readers an in-depth look. Fascinating review. As a still life painter it was great to see another accomplished painter working in that field. I just had a show in Hayward at Sun Gallery entitled Not So Still Life. Richard – congratulations on your show and thanks for the link. I see you also use humor in your work. Great interview – now that I am painting in oils, I find reading about technique and process even more fascinating than before. I can really see the influence of Wonner in her work. There is the same meticulous precision and extreme realism. Nancy – process is a subject we artists can talk about endlessly and I was happy that VR provided such a great vehicle. Fantastic article — this particular still-life artist was hanging onto every word! 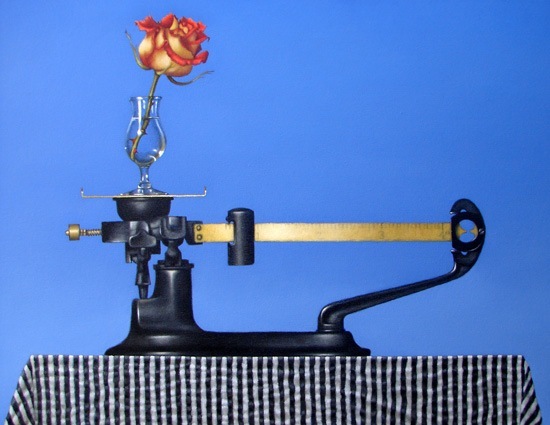 Mimi’s work has such a disarmingly playful manner that it takes a moment to see the deep and often poetic connections between the objects. Brava to another realist who is expanding the repertoire! And thanks also to the daring duo at Venetian Red for bringing us these such a wonderful “read”! Elizabeth — thanks for looking beyond the surface. What an inspiring article and artist! I enjoyed reading about the process and that Mimi was willing to accept her natural desire to paint “tight”. Finding your own voice is what we should all strive for as artists.